While the world is waking up to the news of the horrific scale of the recent flood disaster in the Mahakali basin of Nepal and Uttarakhand in India, several questions are being asked: what kind of climatic events led to this disaster? Could anything have been done to reduce the loss of life and property? What can we learn from this disaster for the future? In this brief note, we address some of these burning questions. The Mahakali river is a transboundary river between Nepal and India with a catchment area of 14,871 km2. It flows for about 223 km in Nepal and around 323.5 km in India to its confluence with the Karnali River in India. The recent rainfall events in the western and far western regions of Nepal and India affected 20 districts in Nepal and several districts in the Indian states of Uttarakhand and Himachal Pradesh. The floods and landslides that ensued have left hundreds of people dead or missing and destroyed property worth millions of dollars. While this is not the first event of this kind (see annexes), it is certainly the most severe in the last 50 years and it happened at the beginning of the monsoon when no one was expecting. 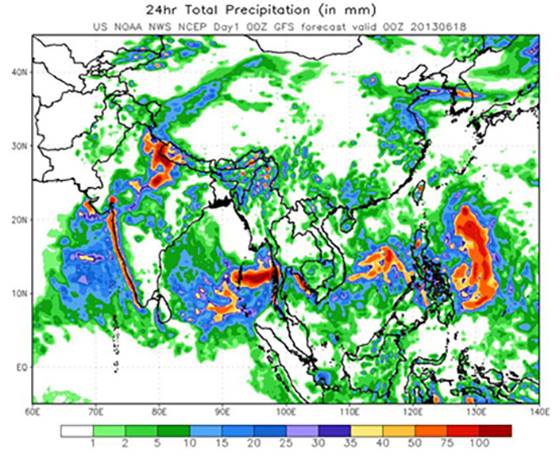 The monsoon rains usually hit Central Nepal around 15 June and Far Western Nepal around 20 June. 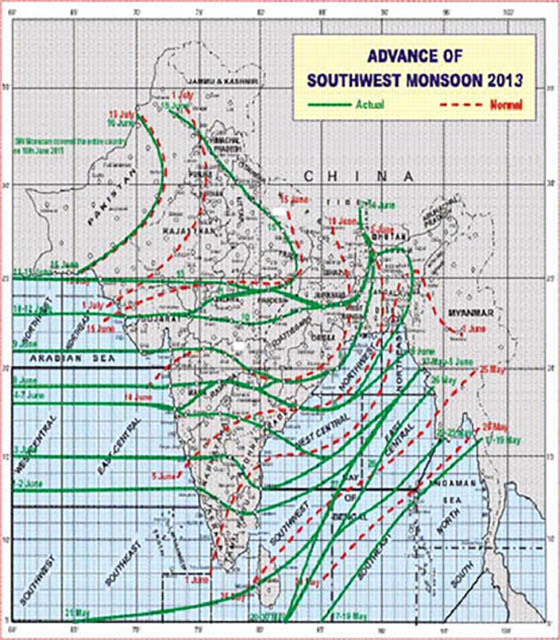 This year, the monsoon quickly engulfed the region (http://www.imd.gov.in/; Figure 2). 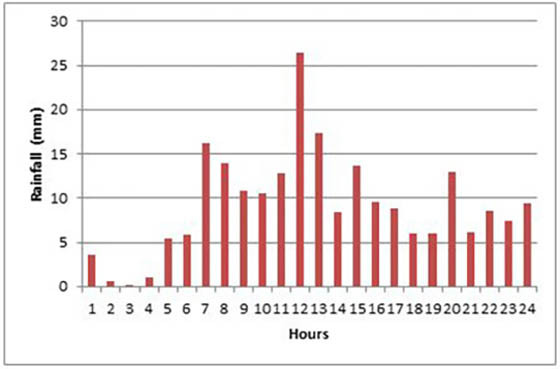 The real-time monitoring station in Nepal reported 80.4 mm of rain on 16 June and 221.8 mm on 17 June at Dipayal, which adjoins the Mahakali flood disaster area (http://dhm.gov.np/; Figure 3 and Figure 4). Surrounding areas such as Dadeldhura, Dhangadi, and Birendranagar in the Far Western Development Region of Nepal recorded more than 150 mm of rainfall in 24 hours on 17 June 2013. Continuous rain in the upper catchments caused the water level in the Seti river east of the Mahakali to rise from 6.94 m to 11.56 m and 5.53 m to 12.81 m in the Karnali at Chisapani on 17 June, as measured by Department of Hydrology and Meteorology, Nepal’s real time network. Unfortunately, there are no real time stations installed by the Department on the Mahakali river. One to three day weather forecasts provided by United States National Oceanic and Atmospheric Administration (NOAA) also indicated heavy rainfall on 17 and 18 June on the border of Nepal and India (Figure 5). Cumulative 3 day TRMM rainfall estimates from 16 June to 18 June show heavy rainfall in the flood affected regions of Nepal and India (Figure 6). The discharge in the Mahakali river rose from 139,000 cubic feet per second to 440,716 cubic feet per second on 17 June – well in excess of the flow of 398,000 cubic feet seconds recorded in the 2012 monsoon (http://www.kantipuronline.com/2013/06/18/top-story/massive-floods-in-mahakali-river-6-killed-update/373456/). While we do not know the full extent of the devastation in Nepal and India, reports are trickling in. In Darchula, in the Far Western Development Region, the flood swept away 77 buildings and displaced 2,500 people (http://www.nepalnews.com/archive/2013/jun/jun18/news12.php). Six were killed in Achham and Baitadi districts and eight are missing in Dhungaad. A reported 150 families have been rendered homeless in Dodhara and Chadani and around 30 families have been affected in Kuda. Four houses in Salyan have been damaged due to a landslide. In Kalikot district, 4 people are dead and 11 missing and 27 families have been displaced. Flood in the Karnali river has affected many villages in the southeast region of Kailali, inundating large areas in Tikapur Municipality and the VDCs of Lalbojhi, Bhajani, Thapapur and Khailad. In Bardiya the floods have intensely affected the Rajapur Tappu region where 2,000 houses were inundated by the Karnali river. Approximately 600 families are still at great risk in Khairichandanpur (http://www.ekantipur.com/2013/06/19/headlines/Monsoon-fury-claims-at-least-20-many-missing/373488/). occurred in the peak tourist and pilgrimage season, increasing the number of causalities, missing, and affected. The monsoon arrived 15 days early in Uttarakhand with continuous rainfall between Friday 14 June and Monday 17 June 2013. This resulted in increased water level and flow in the two main rivers, the Alakananda and Bhagirathi. Cloudbursts and landslides at various locations added to the devastation and impact on the lives of the people. 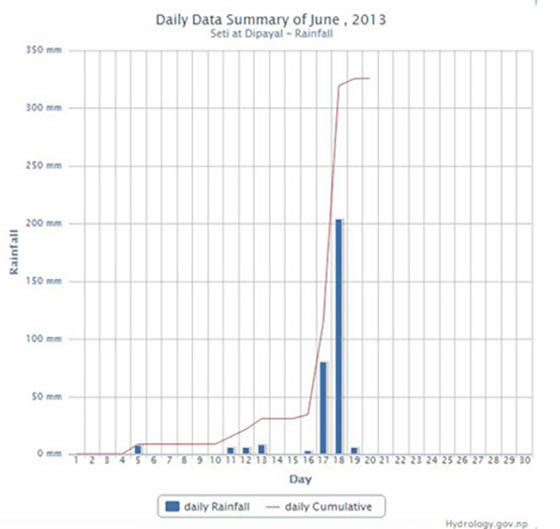 Up to 17 June, the rainfall ranged from 50 mm up to 500 mm. Over 60 hours of continuous rain disrupted normal life. According to the Uttarakhand State government's disaster mitigation and management centre, causalities could run into the thousands with about 90 dharamshalas (rest houses for pilgrims) swept away in the floods. Five districts in the state have been affected, more than 550 people have died, thousands are still missing, and over 50,000 are stranded. What we have learnt from this series of events? Two main lessons can be drawn from the Mahakali and Uttarakhand flood disasters: The severity of the disaster could have been mitigated with a better end-to-end information system and proper infrastructure planning would have reduced the damage. people at risk. There is a need to strengthen disaster management and preparedness mechanisms, which requires awareness and sensitization at various levels to ensure that early warning information is conveyed to end users well in advance. Advances in technology have made it possible to provide three to four hours warning of such events – which is enough to save lives. We need to develop the institutional mechanisms to fully use such technological advances. There is no river-level hydrological monitoring station on the Mahakali river for flood forecasting and early warning. It is recommended that a river monitoring station for early warning be set up jointly by Nepal and India to provide people with some lead-time and improve flood forecasting and management in the basin. The Hindu newspaper put it succinctly when it said that damage could have been contained through proper policies, especially regarding infrastructure development. The development of infrastructure in mountain areas, whether roads or buildings, is challenging. Many mountain roads are contributing a huge sediment load to our rivers and inviting landslides. Many of the settlements are located along flood plains and have developed over the years, encroaching the river banks and increasing the vulnerability to floods. These settlements include residential homes, offices, resorts and restaurants to name a few. There has been limited or no efforts to move these settlements to higher grounds. In the recent floods, large stretches of road and settlements were washed away stranding thousands of people and raising questions about their design, construction, and monitoring. Infrastructure development in the mountains has to be undertaken with caution and proper planning, and must apply different standards to that in the plains. There is also a need to investigate whether or not there have been significant land use changes in the basin resulting in increased runoff. As a regional knowledge and learning centre serving the eight countries of the Hindu Kush Himalayas – Afghanistan, Bangladesh, Bhutan, China, India, Myanmar, Nepal, and Pakistan – ICIMOD is uniquely placed to address issues of a transboundary nature. ICIMOD is focused on improving our understanding of the complex hydrological processes of the Hindu Kush Himalayan region and promoting data and information sharing. It seeks to facilitate cooperation on policies, the timely sharing of information, and the proper management of the water resources. provision of a platform for sharing knowledge and experiences within disaster risk reduction. ICIMOD, in partnership with the World Meteorological Organization and partner countries from Bangladesh, Bhutan, China, India, Nepal, and Pakistan, is working to establish a regional flood information system. Twenty-four hydrometeorological stations have been installed to share real time data to strengthen flood forecasting in four countries. In Nepal, nine hydrometeorological stations have been installed in the Koshi basin and eight in the Kailash Sacred Landscape. ICIMOD aims to assist mountain people in implementing improved disaster risk reduction at national and regional levels addressing upstream-downstream linkages for saving lives and livelihoods. This is achieved through the implementation of transboundary programmes in partnership with regional partner institutions, exploring the application of satellite-based technologies for disaster risk reduction, supporting networking, facilitating the exchange of experience, and serving as a regional knowledge hub, among other things. Institutional strengthening and capacity building of our partner institutions is also being undertaken to contribute to effective disaster risk reduction.